I normally associate chai as a comforting, hot drink, perfect for colder months. But I’ve been experimenting with recipes for my upcoming Smoothie Tasting Soirée and I have managed to transform my warm cup of tea into a creamy, flavorful smoothie that’s great year-round. With the addition of the new Shaklee Energizing Vanilla plant-based Life Shake, not only does this smoothie get a boost of sweet flavor, but it transforms into a complete meal. The protein powder is made from pea, chia and pumpkin – YUM! And it’s full of nutrients, plus it’s vegan, dairy-free and gluten-free. And you’ve heard it from me before but just as a friendly reminder, getting adequate protein in every meal is an important tool for hormone production, blood sugar stabilization and satiety. 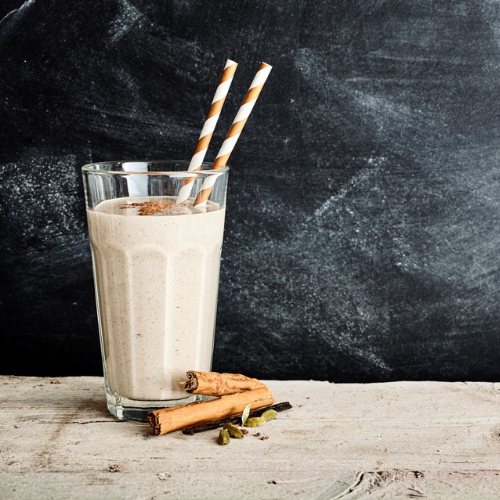 The spices in this smoothie give it the chai flavor, but also add a variety of nutrients too. Ginger is an incredible digestive aid, can treat nausea, helps boost immunity, and fights inflammation. Cinnamon is a powerful spice that improves circulation. And cinnamon’s calcium content is surprisingly high; calcium helps the body remove bile salts, which is important for preserving colon health and preventing colon cancer. I’ve also added a healthy dose of fat to this smoothie with avocado as the creamy base. The avocado will keep you fuller longer as they’re filled with monounsaturated fat – this means that the majority of the fat in avocados is oleic acid. Oleic acid helps fight inflammation, decreases the risk of cancer, and helps prevent heart disease. Avocados are also full of fiber, which helps to remove toxins and waste from the body. Gather ingredients and remove the pit and skin from avocado. Add all ingredients to blender. Blend on high until creamy and smooth.